Weisbard Dental’s philosophy promotes long-term health and preventive care of disease. A healthy foundation is essential to protecting your smile whether it is restored or natural. Long term periodontics success depends upon the health of your gums, the supporting structures, and teeth. Weisbard Dental of Greenwood Village, our dentist and dental hygienist provide routine checks, general and deep dental cleanings, and antibiotics therapy for preventive care services. Our expert dental hygienist will work with you on a maintenance schedule that best suits your individual needs. When necessary we will make appropriate referrals to periodontics specialists. Healthy gum tissue is pink, tight and firm. The bone is healthy and is holding the teeth securely in place. Gingivitis develops when toxins, enzymes, plaque and tartar irritate the gums. The tissue becomes tender and swollen, and is likely to bleed easily. There is usually little or no discomfort at this stage. Periodontal disease destroys the tissues that anchor the teeth in the bone. As the disease progresses, pockets form and allow more plaque and calculus to collect below the gum line. Gum tissue and bone begin to recede, leaving tooth roots exposed and very susceptible to decay and sensitive to cold and touch. Advanced periodontitis causes the teeth to become loose as the disease continues to destroy the gum tissue, bone and periodontal ligament. Periodontal disease is painless. If disease goes untreated, teeth become very loose and may fall out or require removal. Your teeth are continually bathed in saliva, which contains bacteria, calcium and other minerals and substances that help strengthen and protect the teeth. While this is a good thing, it also means that we tend to get a build-up of calcium deposits on the teeth. During your hygiene visit we will remove tarter and calculus (hardened prolonged buildup) from around the teeth and under the gum where floss and a tooth brush do not reach. The hygienist will measure the depth of the “pocket,” or space, between the outer edge of the gum and the attachment to the tooth. The smaller the pocket the better. Up to three millimeters without bleeding is considered healthy. When people don’t floss as often as necessary, dental cleaning visits are even more important, as plaque will build quickly. A visit every six months is recommended for people in good oral health who floss and take good care of their teeth and gums. For some people, more frequent visits may be necessary as recommended by the hygienist and periodontist. At Weisbard Dental, regular monitoring of your hard tissues and soft tissues (gums) is essential in preventive care of disease and maintenance of good oral health. When gingivitis is left untreated, it can advance to periodontitis. In a person with periodontal disease, the inner layer of the gum and bone pull away from the teeth and form pockets. These small spaces between teeth and gums collect debris and can become infected. The body’s immune system fights the bacteria as the plaque spreads and grows below the gum line. Toxins, or poisons produced by the bacteria in plaque, start to break down the bone and connective tissue that hold the teeth in place. As the disease progresses, the pockets deepen and more gum tissue and bone are destroyed. When this happens, teeth are no longer anchored in place, they become looser, and tooth loss occurs. 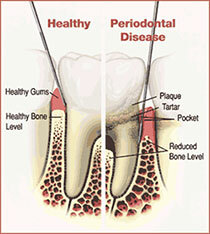 Gum disease, or periodontitis, is the leading cause of tooth loss in adults. Our periodontist and dental hygienist at Weisbard Dental, Greenwood Village, are highly experienced in performing all the necessary interventions to all periodontal disease preventive care. Bleeding gums are not normal. Bleeding is a sign of an infection possibly caused by periodontal disease. We Perio chart your gums at every visit to make sure the gums and bone support around your teeth are healthy. In our office we can explain what your periodontal disease is, offer nonsurgical treatment options and provide antibiotic therapies as needed. This type of infection has been linked to heart disease and diabetes. If your gums are bleeding, please do not wait. Make an appointment to prevent a small problem from becoming a bigger problem. Other problems linked to periodontal disease. Uncontrolled Diabetes: Chronic periodontal disease can disrupt diabetic control. Diabetes can contribute to bacterial overgrowth in the mouth. Smokers with diabetes increase their risk of tooth loss. People with type II diabetes are three times more likely to develop periodontal disease than nondiabetics. Below are a few videos in which Dr. Lee Weisbard promotes everyday health.